Ireland’s James Chawke clinched victory in today’s Mylchreests Junior Manx Grand Prix after race leader Matt Stevenson, who held a thirty second lead at Ramsey on the second lap, dramatically crashed out of the race at the Creg Ny Baa. After a two hour delay due to mist on the Mountain section and to allow time for the roads to dry, the Mylchreests Junior Manx Grand Prix Race on the Isle of Man finally got underway at 12.15. With the first 20 riders based on pre-qualifying seeding Dave Lumsden was the first rider away followed by Dean Osborne and Brad Vicars but Matt Stevenson, who was originally down as 29th in the race programme, was fastest qualifier and was moved into the vacant sixth place on the grid. Lumsden was first to Glen Helen on the road but Stevenson, riding the peoplesbike.com machine, had established a two second lead over Darryl Tweed on the clock at the opening timing point with Wayne Humble holding third a further second and a half back. 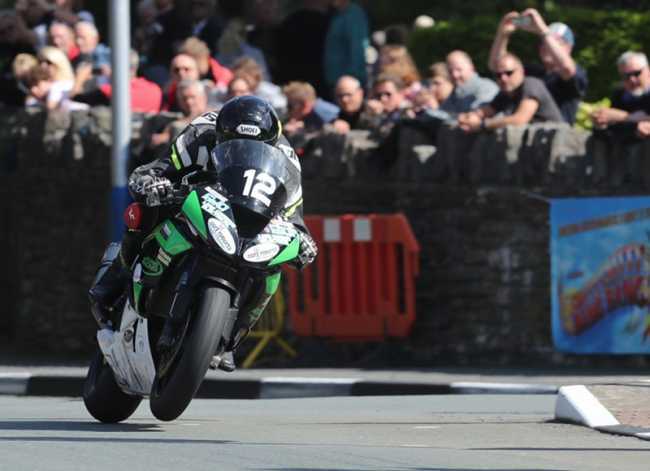 The Isle of Man’s Dean Osborne was fractionally off the third placed rider with Vicars a further second back completing the top five although Dave Butler, who started from 14th on the grid, was reported to have transponder issues but was manually timed in fourth place at Glen Helen. Osborne moved into the top three at Ballaugh but at the front of the field Stevenson’s lead was up to three seconds. Brad Vicars was also on the move and he moved into second place at Ramsey, almost five seconds down on race leader Stevenson but a second ahead of new third placed man James Chawke who with Tweed and Osborne completing the top five. Stevenson was dominating the opening lap and coming through the grandstand at the end of the first lap the Yorkshire man was clocked at 119.807 which gave him a lead of almost fourteen seconds over new second placed man James Chawke (118.378). Osborne’s 118.217 put him in the final podium position. Dave Butler was manually timed in fourth place through the grandstand with Humble completing the top five at the end of the opening lap. Stevenson’s lead was up to eighteen seconds on Chawke and, despite running wide at Ramsey Hairpin, had extended his lead at Ramsey to eighteen seconds over Chawke with Butler now unofficially reported to be holding third place. However, Stevenson came off his peoplesbike.com Yamaha outbreaking at the Creg Ny Baa and although he was reported not to have sustained any injuries, he was out of the race. Coming into the pits at the end of the second lap Stevenson’s accident meant that James Chawke was the new race leader eleven seconds ahead of Dave Butler with Stephen Parsons third and Dean Osborne and Brad Vicars completing the top five. Chawke still led the race at Glen Helen by eight seconds but faster pit stops for Osborne and Tweed moved them ahead of Butler into second and third, and cut the gap to the race leader. Tweed had moved up from eighth at the Grandstand at the end of the second lap. That remained the top three at the end of the third lap with Chawke’s third lap of 113.436 giving him a lead of 12.5 seconds over Osborne (113.468) ) with Tweed (113.911) in third. Parsons (112.161) and Vicars (112.036) completed the top five. There was more drama on the last lap when news came through that Darryl Tweed had run out of fuel at Quarry Bends which saw Parsons move into the final podium place with Vicars fourth and Wayne Humble now up in to fifth. Chawke took the chequered flag in with a last lap of 117.701 to win by over four seconds from Osborne (118.534) with Parsons (118.701) clinching the final podium place. Vicars and Humble rounded out the top five. Yesterday’s Newcomers A MGP Race winner Thomas Maxwell was the highest placed newcomer in 16th place with an overall race time of 113.406mph. James Chawke on his way to winning the Mylchreests Group Junior Manx Grand Prix.